16" x 16" x 6". Float glass and mild steel, 13" x 13" x 6". Mammatocumulus, 2003. 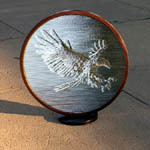 Float glass and mild steel, 15" diameter on pedestal. Lune, 2000. Float glass and mild steel, 27" x 16" x 27". Folded Clouds, 2000. Float glass and mild steel, 20" x 10" x 32". Nike Binding Her Sandal, 2000. Float glass and mild steel, 28" x 10" x 20". 22" x 26" x 2". 32" x 14" x 2". Laocoon Sans Serpent, Nike Binding Her Sandal.